Parents are an essential part of what makes the Greek experience great and what better way to support your daughter than by joining or organizing a Parents’ Club for your daughter’s chapter. A Parents’ Club is a simple way to stay involved with your daughter’s activities in college, while allowing you to help the organization that your daughter has joined. Most Parents’ Clubs provide tangible and monetary support to their daughters’ chapters. Parents’ Clubs have provided resources for chapters, which they would not have been able to provide for themselves. Parents’ Clubs set their own meeting schedule. These clubs are not required by any chapter. Although activities will vary from campus to campus, the goal is the same, to provide assistance to your daughter and the organization. This is also a great way to meet other parents of members and form wonderful friendships. 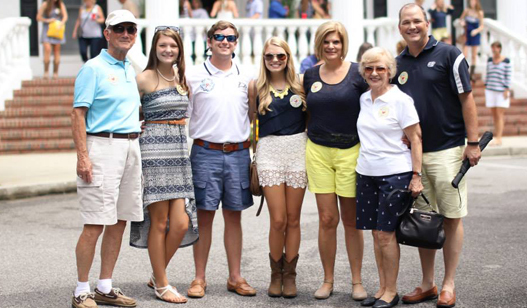 Remember, you do not have to be an Alpha Delta Pi to be a member of the Parents’ Club. It is essential that the Parents’ Club work with the chapter. The best way of doing this is establishing a liaison between the club and the chapter. Usually, this is a collegiate member who is an officer and is able to provide you with information on what the chapter might need and a list of the parents along with contact information. After contact has been established with the parents, you can begin to plan the first meeting. Many campuses will have a Parents’ Weekend, which is always a convenient time to hold a meeting. Work with the chapter organizers of the weekend to plan the best time to hold the meeting. Prior to the first meeting, consider setting up a checking account for the Parents’ Club; begin to draft bylaws and brainstorm ideas for activities or ways to support the chapter. There may be several parents that emerge as leaders or who might be willing to volunteer their time. Some of the positions to consider are: President, Secretary and Treasurer. If the President would like to serve as the liaison with the chapter they may, or you can elect a liaison. Dues can be a set cost or a donation depending on what you think is best. Fundraisers are a way of establishing income for the club. Taking the time to decide what types of activities or support you would like to provide for the chapter is important. Click for a list of Activities for Parents. What would you as the parents like to accomplish throughout the year? What is the purpose of this organization? Setting these guidelines during the meeting will help you in determining your goals. Creating bylaws will help you establish some organization to the club. These are not required, but suggested. Here are Sample Parents Club Bylaws. Membership dues for the Parents’ Club are not tax deductible. Because some parents live out of town and may not be able to provide as much support as parents who live in town, you may determine in town and out of town dues. Usually a difference of $5 to $10 is sufficient. If the Parents’ Club determines it wants to allocate funds for improvements on the chapter house, make sure you are in contact or have approval from the House Corporation, as well as the Housing Resource Director for the District. The chapter can provide you with the contact information for these people. It may be beneficial to have a liaison with the House Corporation. Consider inviting the chapter liaison to the meeting so parents can put a face with the name. Invite the chapter president, property manager and any other chapter officers who would be beneficial for parents to know. There is no right or wrong way to run a Parents’ Club. The purpose of these clubs is to provide you a way of giving more support to your daughter and the organization. You can choose to make your club as formal or as informal as you would like. You may also have activities every month or on an as needed basis. The most important thing for you to remember is that you are doing this to help support your daughter and it should be enjoyable for you.